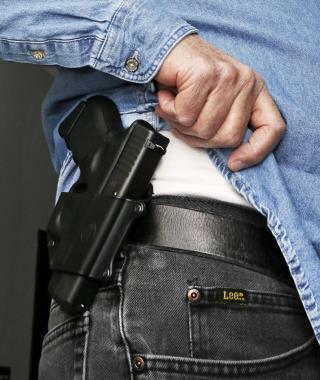 (Newser) – Dealing a blow to gun supporters, a federal appeals court ruled Thursday that Americans do not have a constitutional right to carry concealed weapons in public. In a dispute that could ultimately wind up before the Supreme Court, a divided 9th US Circuit Court of Appeals said local law enforcement officials can place significant restrictions on who is allowed to carry concealed guns, the AP reports. By a vote of 7-4, the court upheld a California law that says applicants must cite a "good cause" to obtain a concealed-carry permit. Typically, people who are being stalked or threatened, celebrities who fear for their safety, and those who routinely carry large amounts of cash or other valuables are granted permits. The ruling overturned a 2014 decision by a three-judge panel of the same court that said applicants need only express a desire for personal safety. Open carry versus standing your ground. Thinning the ammosexual herd. Defendent: But your honor an armed man entered the cafe and I had to stand my ground. Judge: Quite right ....Case dismissed.